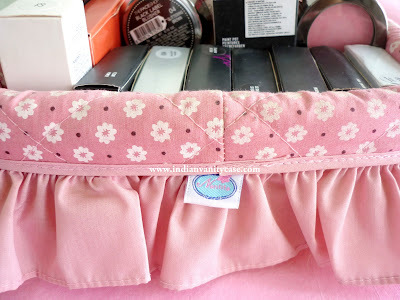 This is how I store most of my blushes & some bronzers. I bought this basket many years ago from Bangkok, together with a matching jewelry box. 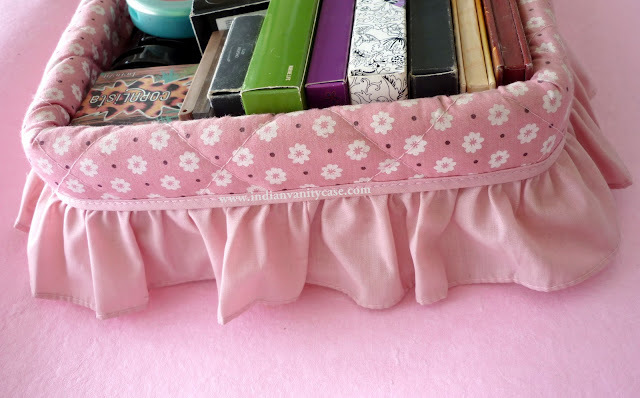 I love the quilted and frilly pink cotton fabric with white flowers. It is not stuck on the basket and can be taken out to wash. I don't remember how much I bought it for exactly, but I'm sure it didn't cost more than Rs.500. I don't throw away the outer boxes of the blushes, coz then it's easier for me to find what I want when I can see the names on the top of the boxes. You can make something like this for yourself if you want. Let me know if you want the pattern details. It was made by a company called Nantita. I googled it and found their website! How cool! Click HERE to go to it. P.S: I'm having trouble posting today. Blogger is telling me I ran out of photo storage space (?). Any advice? 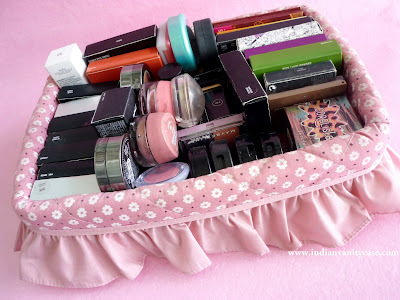 The basket is so cute :) I want one too. thanks for sharing. 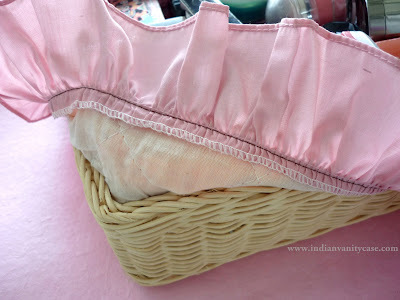 awwww such a cute basket .... CZ u r such a pinky pinky baby doll :) i wish i have a baby girl like you .. who likes to spend a lot and loves to do makeup and what not ?? Very pretty ... Is seems you have to buy another one soon as you may run out of storage space in this one :) ... can you show your blush collection to us .. and what all do you love ! aww...thats so cute..me likes...well actually double likes..Do share the pattern C..